Jewish Family Service is happy to announce that Brian Sindel recently stepped up to be the Polack Food Bank Manager after four years as the Food Bank Specialist. 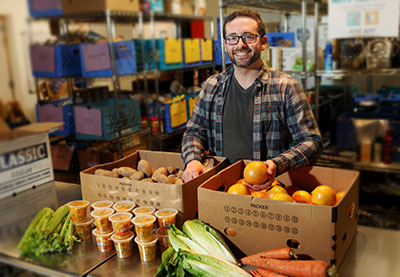 As the Food Bank Specialist, he managed the Home Delivery Program that provides nutritious foods — with the help of volunteers — to about 400 individuals who are homebound throughout the Puget Sound region. Brian also managed the monthly Eastside Pop-Up Food Bank that focuses on providing culturally appropriate foods to Russian-speaking, older adults. As Brian has grown in his role at JFS, so has the Food Bank. Brian talks more with us about what brought him to JFS, changes he has seen and what he looks forward to as the Food Bank Manager. What drew you to JFS and food security? I’ve always been obsessed with food, sometimes in a good way, sometimes not. Growing up I had really unhealthy eating habits and was quite overweight. At a fairly young age, I took an interest in nutrition and felt empowered to use that knowledge to change my life rather drastically. As I grew older and wiser, around late high school and college, I learned more about systemic inequality and the way it figures into our food system. My interest and obsession with food and nutrition shifted as I became aware that many groups of people did not have equal access to healthy food and the opportunity to take charge of their own lives like I did. I majored in food systems and social justice in college, taught nutrition in low-income elementary schools and connected with Seattle food banks through that work. I also happen to be Jewish and have long considered myself to be ‘coincidentally Jewish,’ as it wasn’t an impetus for me working at JFS. I feel lucky to be able to incorporate the teachings and cultural background of my lineage into my daily work. I’m looking forward to doing more of everything. I get to work more closely with staff throughout JFS, and I get to work more closely with the Seattle Food Committee, addressing hunger at a city-wide level. I also get to collaborate and discuss decisions at a higher level at JFS when it comes to serving community members with dignity. What important changes have you seen take place at the Polack Food Bank during your JFS career? I’ve seen our Home Delivery Program and services with the Food Bank grow to serve more of our community members. In the past year, we expanded to serve a sixth zip code that includes part of the International District neighborhood. We have also grown our local partnerships to include three organic farms, support from community groups for year-round food collections and donors who regularly support providing the Food Bank with fresh foods. Through all these increases, we’ve also seen larger number of volunteers become engaged and get involved at JFS. What have you learned from JFS volunteers, clients and community members? I’ve learned just about everything from volunteers, clients and community members, from how to best display food or treat people with the most respect and dignity. I’ve learned what kasha and mung beans are and found out that my mom grew up eating kasha. I’ve learned how to say the names of most fruits and vegetables in Russian, along with the word for toilet paper. I’ve learned that the younger you volunteer and learn about social issues, the more likely you will continue that work and education as you age. I’ve also learned just how important food banks are for our community because of how difficult it is to survive on a low-income and how little financial support there is available through welfare programs to help people elevate themselves and their families out of poverty. But the most important thing I have learned is that if you ask, you shall receive. The support from volunteers, donors and the community is incredibly generous and makes our work possible.